Inject bold European culture into your next social event by wearing Fleur De Lis Cufflinks. 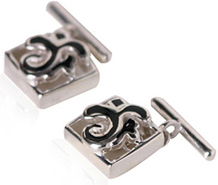 These cufflinks make the perfect gift for anyone you know that relies heavily on European fashion. Designed from 925-grade sterling silver, this pair of cufflinks presents a confident appearance that makes you stand out in a crowded world of driven professionals. Give these cufflinks to your boss to impress or to a family member that cherishes European designed fashion accessories. The black design on these cufflinks make the silver look stunning. This pair would look great with any silver jewelry you wear.